At the K show 2013, WITTMANN is presenting at booth A04 in hall 10 a large tempering unit in a dual zone configuration, the new temperature controller TEMPRO plus D-2-L (the “L” stands for “large”). In addition, the new models of directly cooled temperature controller series TEMPRO basic C120 are shown. The WITTMANN TEMPRO plus D-2-L represents a completely new development. It has two heat exchangers for each circuit. Every heat exchanger can deliver 18 kW of heating and up to 40 kW of cooling capacity. Through this configuration, it is possible to offer this unit with a heating capacity of up to 36 kW and 80 kW cooling capacity per circuit. For the optimal transmission of heating and cooling to the consumer, the system can be fitted with one of two different pumps. In the standard version, the TEMPRO plus D-2-L is equipped with a 2.2 kW peripheral impeller pump, which has a maximum pump capacity of 90 l/min (at max. 6 bar). A 4 kW peripheral impeller pump with a pump capacity of 200 l/min (max. 6.5 bar) is also available as an option. The TEMPRO plus D-2-L features a new cold water valve block with a modular arrangement, which can be expanded indefinitely depending on the equipment variant. This makes it possible to incorporate customer-specific solutions – such as a cold water bypass for cooling the return line, or emptying the mold by means of compressed air – easily and inexpensively into the production process of the temperature controller. Moreover, the standard package includes important equipment features such as automatic filling, emptying the mold by reversal of the pump rotation, system pressure regulation, leak monitoring, and much more. At K 2013 the new TEMPRO plus D-2-L temperature controller is being presented in the 180 °C dual circuit version. Versions for 140 °C and 160 °C are also available. WITTMANN also plans to produce a single-circuit unit and a 90 °C version in an open configuration.The new TEMPRO plus D-2-L is suitable for applications with variotherm temperature control. The variotherm process was presented for the first time at FAKUMA 2008, and over the course of the past five years the design has been extensively refined in terms of operability, control precision and process optimization. The area of extrusion opens up further possibilities for the TEMPRO plus D-2-L. But ultimately a temperature controller with significantly larger dimensions was mainly needed in order to be able to offer a temperature control system which is also suitable for large machines – not least as part of any operating environment which includes a MacroPower injection molding machine from WITTMANN BATTENFELD. The success story of the directly cooled temperature controller began in 2009 when a system perfectly matched to the needs of the plastics industry, the TEMPRO direct C120, made its debut at the US trade fair NPE. And then with the TEMPRO primus C120, WITTMANN was able to extend the temperature controller line for large systems downward, while setting the bar on the market in terms of quality and technical features. Thereafter, the industry demanded temperature controllers which had to meet various demanding requirements: The devices had to be as compact as possible, but also offer versatile configuration options and be equipped with direct cooling and suitable high performance pumps. Moreover, they had to provide differentiated heating capacities for specific applications and also be able to deliver correspondingly high cooling capacities. 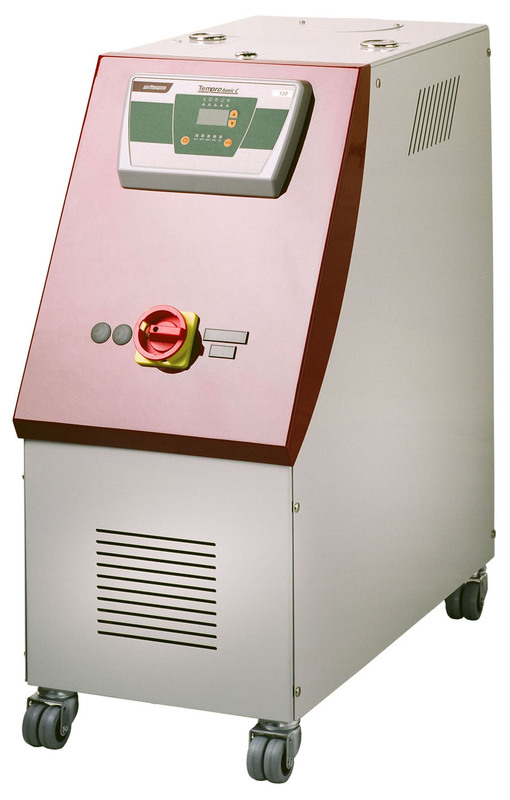 The demand for such high performance units led to the development of the TEMPRO basic C120 temperature controller series. Just as with the TEMPRO primus C120, the appeal of the systems in the TEMPRO basic C120 line lies in their compact construction and the versatile choice of primary technical components: the pump (0.75 kW – 200 l/min – 2.35 bar or 1.5 kW – 200 l/min – 3.65 bar), the heating capacity (12 kW or 18 kW ) and the cooling valves (⅜” or ½”). TEMPRO basic C120 temperature controllers are also available in a somewhat larger version. In that case their pump size can be configured in the same way as the TEMPRO direct C120, whereby the pump capacities then range from 0.75 kW to 4 kW. 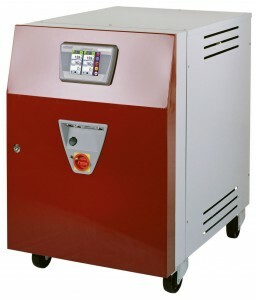 The standard heating capacity of 12 kW can also be increased to 18 kW as an option. And the available choice of cooling valves (⅜”, ½”, ¾”) makes it possible to adjust cooling capacities in fine increments. WITTMANN very clearly stands out among its competitors in this equipment sector once again, because as a special highlight – besides pumps with capacities of 2.2 kW and 4 kW – it ultimately offers equipment options which enable heating capacities of 36 kW and even 46 kW. All of these technical configuration options with the standardized upper temperature limit of 120 °C guarantee trouble-free and optimized production processes wherever application-based high cooling capacities are needed in combination high feed rates.